Learn more about fashion’s most comfortable footwear trend. The sneaker has made a transition from an athletic necessity to a total fashion do. Combining comfort, classic vintage style, and athletic history, the sneaker’s transition makes sense. Below, I’ll share a quick history of the sneaker, give you some outfit inspiration, and suggest some tips on buying the perfect pair. The first sneaker, or a shoe with a molded rubber sole, was the 18th century plimsoll created by Keds. Right from the get go, these shoes were labeled as functional items that could handle more strenuous athletic activity. FactMonster says that by 1917 these Keds were being mass produced. The next year, Heddels says, Converse All-Stars were produced as the first basketball-focused sneaker. Converse were the first high-top sneakers and the first to seek a celebrity endorsement. Converse had basketball player Chuck Taylor both advise and endorse their shoe and it soon took off. Adidas then took the American sneaker global. Athletes across the world were starting to wear these rubber soled shoes. After this trend went global, sneakers began to become stagnant, seen as simply comfort shoes and not necessarily stylish ones. CNN reports that in the 1970s Nike was able to revitalize the sneaker to the street style shoe of choice that it is today. After this street fashion renaissance, high fashion designers wanted to get in on the game. Gucci ushered the sneaker onto the runways and designers like Prada and Lanvin followed suit. At the same time, sneaker-head culture started to grow. Nowadays, the street style and high-fashion strands have united and designer and athletic wear collaborations define modern sneaker culture. Combining fashion fabrics like leather with vintage sport sensibilities, sneakers today are just as likely to be paired with a fashion week outfit as actual athletic wear. Below, the sneaker is styled in two different ways. Although I often use the same product for each outfit, this time I decided to show how to wear two different sneakers – a basic white pair and a more colorful and uniquely-shaped pair. Ease into wearing sneakers by pairing simple yet trendy Adidas Superstars with your everyday basics. 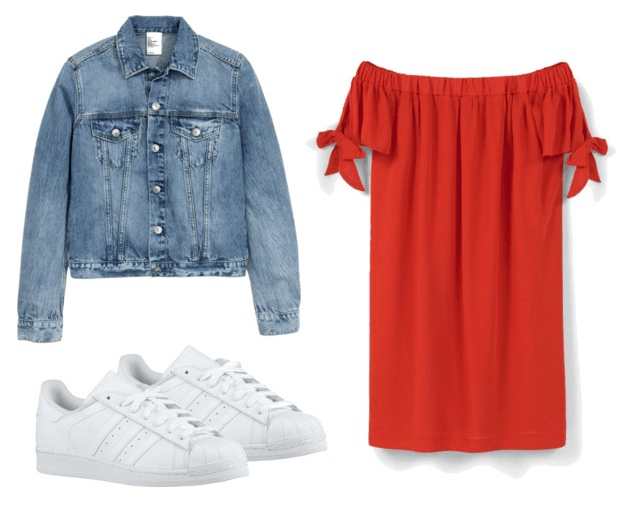 A cute red off-the-shoulder dress pairs well with the sneakers and adds some color and girlyness to the athletic shoes. A denim jacket can be thrown on top to battle against unpredictable temperatures. Really go for it in this pair of Reebok sneakers. With their unique shape, their yellow color scheme, and their cool star pattern, these shoes make a statement all on their own. Let them do the talking by pairing them with cute basics. A white denim mini looks great paired with a ribbed black tank. Black sunnies and a basic black baseball cap add to this stylishly athletic look. It’s all about the fit. Although sneakers have become super fashionable, they are still athletic sneakers at their core and thus really should be functional. Go into an athletic store and try on tons of pairs until you find one that fits your arches, allows you to comfortably move your toes, and that keeps your ankle secure. Find your favorite brand and style and stick to it. Although each year it seems like one type of sneaker is always the “it” shoe, I think it can be more fun and more stylish to find a sneaker that fits your style rather than one that is trendy that season. You can always branch out into multiple colors from your brand. Consider color. White and black sneakers are great because they can be paired with pretty much anything but sometimes they can feel boring. If you have a bold style, colorful sneakers, though less versatile, can make much more of a fashion statement. How do you feel about sneakers? Do you have any tips on how to wear them or what to consider when buying? Any other classic fashion pieces you’d like to know more about? Leave a comment and let me know!